This week in the world of cartoons we take a look at the season finale of Adventure Time which aired earlier in the week, another epic Rick and Morty, along with a Thor-centric episode of Avengers Assemble. Rick and Morty&apos;s Justin Roiland is here to answer your questions! 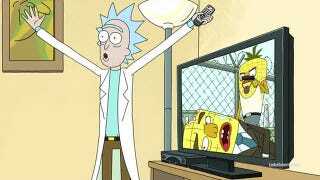 Rick and Morty - "Rixty Minutes"
Rick and Morty might be the best show on television right now. Love yourself, watch the show. This week Rick constructs a cable box that gives the family access to television from other dimensions, with the family quickly seeking out alternate versions of themselves (Rick's son-in-law is a Tom Hanks-level star in several). The cable box serves as a jumping point for a number of bits (Gazorpazorpfield!) intertwined with a serious side-plot that might cause you to tear up at the end. How can you not love Gazorpazorpfield? The language in episode might be NSFW for some, so grab earmuffs for the sensitive. My Little Pony- "For Whom the Sweetie Bell Tolls"
One pony will live...one pony will die. Sweetie Belle is vying with Rarity for center stage, and she's ready to do anything for attention. Archer - "Rules of Extraction"
Archer: Vice is winding down, with Ray possibly becoming re-paralyzed (hmm...is that a word?) this week while the ladies of ISIS aim to cheer up Mallory. Language in this clip may be NSFW. Adventure Time - "Billy's Bucket List"
The season finale of Adventure Time starts with a rap battle before tugging at your heartstrings when Finn tries to complete Billy's unfinished adventures. Check out the Finn vs. Rap Bear battle above. Odin is pissed. The ruler of Asgard leaves his lofty realm to bust into Avengers Tower and bring Thor back home. Thor attempts to prove that Earth needs him by taking on an obscure Lee & Kirby creation, Mangog. Top image is courtesy of Adult Swim.